One of the major benefits of having an outdoor living space is having the ability to spend time relaxing outdoors. Patio furniture, outdoor kitchens, and other furnishings add to the ambiance of your patio or backyard and allow you to enjoy good weather, fine food, and the company of friends. One other aspect of outdoor living is your fire pit; among its many benefits, it provides a gathering place, serves as a decoration, and allows you to cook outdoors in a rustic campfire-style setting. Gas fire tables have many advantages – however, not all of them are made equal. When installing your fire pit, you have numerous choices, but the main two that you’ll have to distinguish between are wood-burning fire pits and gas fire pits. The difference is both in the type of fuel used and the structure. Wood-burning fire pits use wood, coal, or other organic fuels in order to stoke their flames; they are usually built by digging a shallow depression in the ground beneath or on your patio, and then layered with brick or stone. Gas fire pits, on the other hand, are powered by natural gas of the same type that fuels your stove or water boiler; they are built in much the same way as wood-burning fire pits, but also have to connect to a gas line that runs underneath your home. When choosing which type of fire pit you would like to have, there are many factors to consider; however, the benefits tend to tilt in favor of gas fire pits. Take a look at the five advantages of gas fire pits, and decide for yourself which type is better for you and your home. Wood-burning fire pits may send up nice flames, but after the fire subsides, you are left with piles of ash to clean up. You have to make sure to regularly clean out the old ash that piles up, as well as scrub the pit to maintain a clean look (as smoke leaves residue on any bricks or stone that you have lining the pit). Because outside gas fire pits are powered by natural gas, they do not require any of the cleanup that wood-burning fire pits take. Furthermore, you won’t have to deal with messes left behind by coal or coal dust, which can leave black residue on your patio or other outdoor living space. You never have to worry about “feeding” a gas fire pit, as you would with a wood-burning fire; you can sit back, relax, and focus on enjoying your outdoor living space, as the gas fire pit operates with a flip of the switch and does not need stoking. Furthermore, you don’t have to face the hassle of remembering to purchase coal, wood, or other fuel in order to keep your fire going. Furthermore, gas fire pits avoid the smoke and dust that comes with regular fire pits, as they don’t emit any noticeable or harmful byproducts; thus, you are reducing the health risk that comes with being around smoke for extended periods of time. This will save your lungs much stress down the road. 3. They’re more visually appealing. Outside gas fire pits come in a much greater variety of designs, including those made of different types of stone, brick, and even glass. Because wood-burning fire pits leave unappealing residue, you often have to sacrifice aesthetics for practicality; however, with a gas fire pit, you can focus on what will simply look best for your outdoor living space. Fire glass, an accessory that comes specifically with gas fire pits, provides a unique look for your outdoor space; you can see flames leaping from glass of different colors and sizes, which provides beautiful refractions of light, especially in the dark. This experience is one that wood-burning fire pits cannot provide; the visual appeal of gas fire pits is its ultimate benefit. If you have small children or pets, you don’t have to worry about them coming too close to the fire, as you can control the flame level of your gas fire pit just as you would with a stove or other apparatus. Furthermore, there are no sparks or other dangerous aspects that come with a wood-burning fire; this includes the potential harm caused by excessive smoke that wood-burning fires produce. 5. They can be bought online easily. Outside gas fire pits are found online at a variety of retailers at affordable prices. Because you can shop around for different designs, you are sure to find one that you like, and can even mix and match with your patio furniture and other outdoor furnishings. 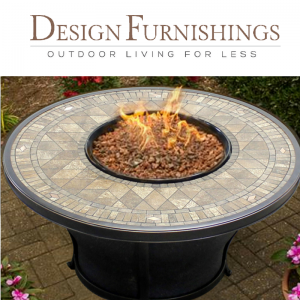 You can find a variety of fire pits online at Design Furnishings http://www.designfurnishings.com/ ; simply navigate to their “Accessories” section, where you can find different designs for fire pits as well as fire glass and fire pit covers.